Michelle Won Park, Korean cuisine expert and TV anchor tackles a difficult pairing dilemma: Korean barbecue and wine. 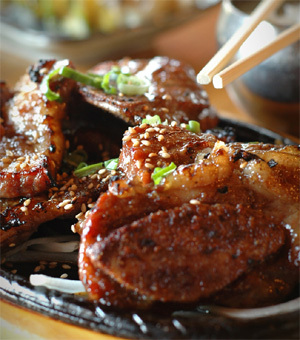 Korean food innately allows you to create your own personalized flavor combinations. You can include more lettuce, less bean sprouts and just a smidge of chili paste alongside your barbecue, then pair your wine accordingly. Also, you do not need to eat spicy, fermented, scarily-red cabbage known as kimchi with Korean barbecue. Remove the kimchi and you remove a lot of the difficulty of the pairing. Don’t get me wrong, I love kimchi, but it is the king of the Korean table and manages to overpower everything with its pungency. Due to the kimchi and the other spicy, salty flavor options on the traditional Korean table, Korean barbecue’s drink accompaniment of choice is usually soju, a distilled beverage traditionally made from rice. It tastes strongly of alcohol with a hint of sweetness. It’s a roughed-up version of saké and it holds its own against the smoky, sweet, and savory flavors of Korean barbecue. Matching high-intensity soju with the bold flavors of Korean barbecue is one route, and a robust California Zinfandel or rich Malbec may also work, but I prefer to find wines that add support to the delicious umami and luxurious fatty flavors of the dish. I actually quite enjoy a sparkling wine with a hint of sweetness; it is along the lines of the light Korean beers like OB and Hite that are a mainstay on the barbecue table. The acid and bubbles cut through the caramelized sugars and intense fatty flavors of the beef. I also find a brighter Syrah or Shiraz will add some depth to your bite, bringing out those buttery flavor elements of the beef, while complimenting its sweetness. Finally, the most uncommon pairing I’ve recently fallen in love with is a spice and quinine-bark-infused wine that I discovered at a foodie dinner party. Barolo Chinato has surprising spiced herbal notes that add an Asian flavor component to the entire experience; it’s not for the faint of heart but makes a nice digestif after Korean barbecue. Michelle Park is a journalist who has worked on both coasts covering wine and food, from fine dining to dives. She currently reports on New York City’s top restaurants, bars and nightclubs on NY1. Follow her on Twitter @michellewpark. I must call this the easy version of my mother’s because the real recipe takes three days of marinating, and even I don’t have the patience for that! Combine all ingredients and marinate the meat in the mixture for at least 8 hours, preferably overnight. Grill and serve.